Well, not exactly pennies but very, very good prices. I set myself a goal: beautiful pieces under $250. Broke the rule once, but wanted to show you, thanks to the proliferation of freshwaters, artful mixes and some sales, you could have a divine and affordable new necklace for the cost of dinner for two in the overpriced, precious locavore restaurant le Duc and I tried last night. A can of the best tuna, a few tomatoes, a few capers, good pasta, and the wine that's in the fridge, and I could have one of these around my swan neck, dadgummit. 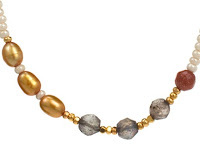 At this price point, a few corners get cut: gold-filled instead of gold, even a mix of shell (man-made from ground shells) and cultured pearls in the same necklace. This is smart design; each piece has allure and satisfying quality. 1. Wasabi white pearl and mixed bead necklace (top photo) in a fall palette: white seed pearls, gold-filled oval beads, labradorite, hessionite (the russet ones), sparkly goldstone, a paltry $84 at Twist- I think this was the cost of wine plus desserts. 2. 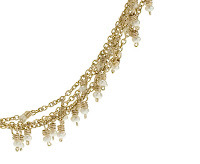 Bo J.C. white seed pearl necklace (detail shown) broke the $250 barrier, but the minor upgrade returns max ooh-la-la: four strands of dangly pearls on 16-inch goldfilled chain. 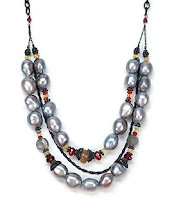 So wearble and at $282 (also from Twist), a definite pearly presence. 3. Far left, Avindy oxidized silver chain with grey fresh water pearls, and citrine, garnet and whiskey quartz, $230 at Fragments. 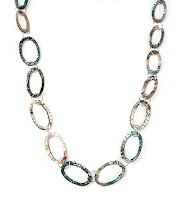 A double strand fills a neckline beautifully. 4. 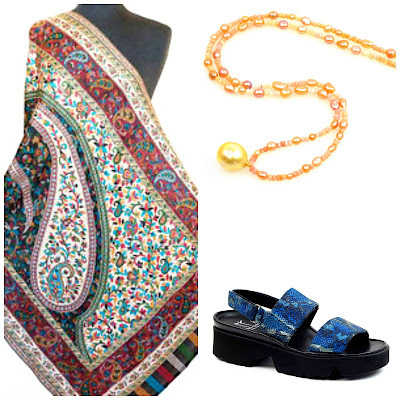 Near left, above: Mother-of-pearl's natural irridiscence is a sensuous delight; this Chan Luu 22-inch oval link necklace would lift a fall jacket. On sale for $129 (reduced from $215) at Fragments. 5. The dramatic, delicious Chan Luu necklace (from Fragments) would break the barrier at full price but it's reduced from $320 to a mere $192! 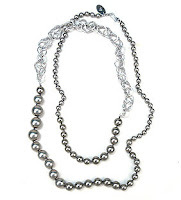 A luxurious 42-inch sweep of silver chain strung with shell (created) pearls and gray freshwater pearls invites you to wrap, knot, play. Interesting how this piece married real and costume with dramatic success. I love that 3rd one especially. And I tend to like most of Chan Luu's pieces, and I like these even better at the sale prices! Love the Bo J.C necklace! I want to thank you, as on Twist I found confetti hoops for my store...$100 and under... perfect for the penurious shopper at Christmas!Perfect at any time. The Chan Luu you have shown is a really good deal. 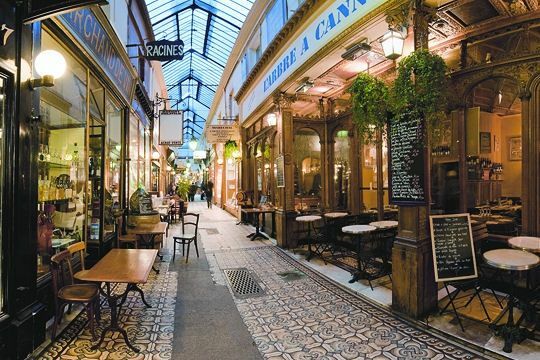 I used to buy all my jewels for the store from Fragments in New York. Beautiful things in their showroom but my clientele changed and sadly I am surrounded by less exquisite eye candy that sells more rapidly. 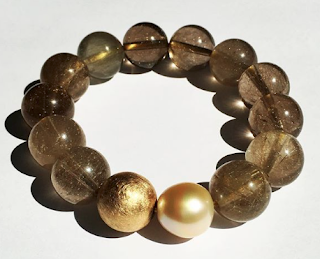 Chan Luu was one of the best sellers- her eye for detail and stones is creativity personified. I was in Fragments showroom the day after 9/11 as the smoke plumed skywards- ash still everywhere- And the glass shelves were covered by the airborne dust that settled there. But, the jewels still shone in a sort of day after Vesuvius way, beyond the ashen dust.. Points of light emerged. On a brighter note to anyone buying a piece of Chan Luu, it is definitely wearable art. A beautiful gift to give or receive. Pseu: I fixed link, thanks! ma: Chan Luu also sells items on Garnet Hill's site but IMO Fragments has bolder pieces. Anjela: Whoa! Those Viv & Ingrid hoops are great, especially the pearl ones!